NEWTON, IA – (June 14th, 2010) — Sage Karam kicks off this week with the start of competitive swimming and an introduction to the sport of Lacrosse. The busy week will be capped off with a USF2000 race on Saturday on the oval at Iowa. “I am really looking forward to the banked oval at Iowa. But, the thing that is really exciting is that the race is partnered with the IZOD IndyCar series. It’s a lot of fun to race in front of the IZOD crowd and to have the entire Andretti Autosport team on-site supporting me,” said Sage. The Iowa event is the final oval in the USF2000 Road to Indy program. The following week, the AA transporters will be hauling the #8 Comfort Revolution car back East, close to Karam’s stomping grounds, to Millville, NJ. “Obviously, the New Jersey Motorsports Park is as close to a hometown event as I can get, but there’s no looking past Iowa first. At 15 years-old, Karam is the youngest driver in the USF2000 series and was actually signed to Andretti Autosports as a 14-year old. He is leading the USF2000 series championship point standings. Andretti Autosport is 2nd in the team standings. “I want to extend my points lead coming out of Iowa and would like to see Andretti Autosport leading the team championship too,” Karam added. 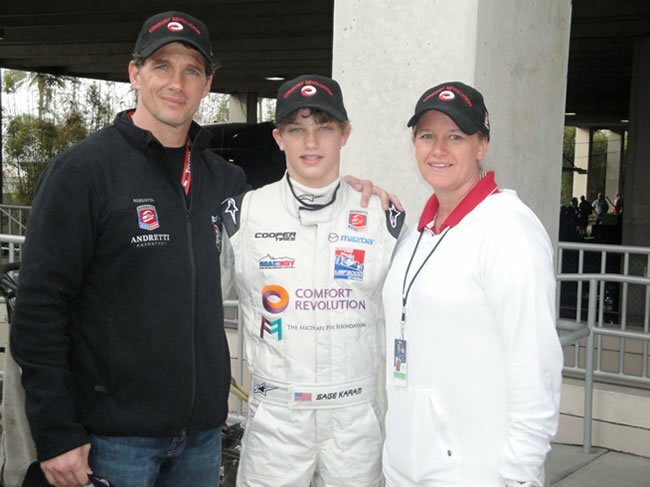 Sage’s success is based on the generosity of his manager and sponsor Mr Michael Fux and associate sponsors, friends and partners: Comfort Revolution, Andretti Autosport, Bell Helmets, Alpinestars, Orwig Management, Switch Engines’ Kevin Nelson, ArtRotundo.com, Walters Web Design, SmitHahn Inc.